This week we have a guest post by Emily Swanda. She is a success and productivity coach for high achieving women. For those of us with kids, our mornings can be the most stressful and difficult part of our day. I am a firm believer that our mornings dictate how the rest of our day will go. If you start out on a rocky road it probably means the rest of the day is a downhill slide to rock bottom. Having young people to take care of makes it crucial to have a system in place so we don’t lose our minds before 8 a.m. A few years ago I would go through my whole morning routine, get the kids ready for daycare and by the time I arrived at work at 7:45 a.m. I needed a break! It was only a few weeks of experiencing this stress and overwhelm did I create my ideal morning routine so I could truly enjoy the first few hours of my day and those precious moments with my kids before being at work all day. I have 2 sons, ages 10 and 8, and after lots of trial and error we have our morning routine down pat. Keep in mind that I got serious about my morning routine when my oldest was 3 and my youngest was 6 months old. The routine looks different now but the same key components are the same. Here are the 5 tips I recommend you use to create your own morning routine. Do you struggle with juggling work, family and everything in between? 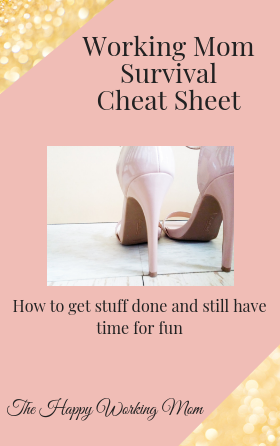 Download my FREE Working Mom Survival Cheat Sheet and get off the hamster wheel today.